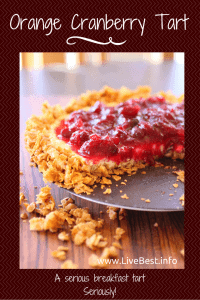 With a crunchy Corn Flake crust, creamy yogurt, and gorgeous cranberries, this protein-packed Orange Cranberry Tart recipe is a breakfast recipe you may serve for dessert! 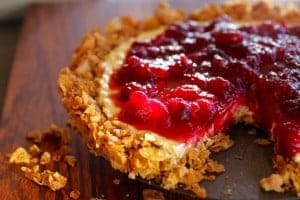 Orange Cranberry Tart. Sounds like dessert, right? The reality is this is breakfast! A healthy breakfast dessert!! Wouldn’t this make you smile on a dark winter morning? It did me. And my tastebuds. Pie for breakfast? Yep, and it’s a healthy breakfast! The crunchy crust is walnuts and Corn Flakes. The creamy orange filling is a just sweet enough protein-packed, egg-thickened yogurt. The crowning cranberries make it fresh and seasonal. And, oh, so, pretty. I wouldn’t steer you wrong at the breakfast table. You might eat yogurt with cereal and nuts for breakfast. Check. Or you might eat eggs and fruit for breakfast. Check. It’s almost too good to be true! 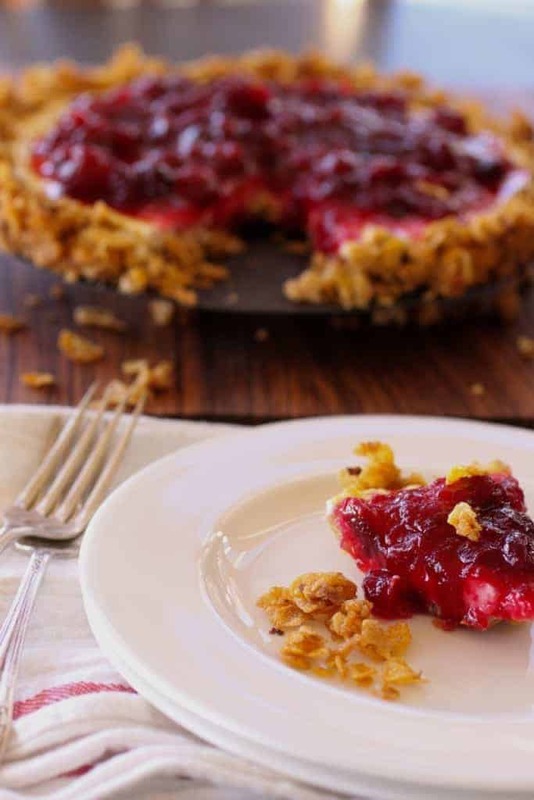 As a source of vitamin C and fiber, fresh cranberries are more than a pretty tart topper. they’re a healthy addition to any dish. These bright red berries contain plant compounds that support gut health, improve heart health and reduce inflammation and the incidence of urinary tract infections. My LiveBest philosophy includes feeding my soul. Planning and keeping things in order is soul food for me. This recipe meets those needs because no special ingredients or techniques are required. Heading into the holidays, Orange Cranberry Tart is a double header in the planning department. This is one versatile recipe. Seriously, besides breakfast, you could serve this for a holiday brunch or dessert and no one would know it’s a… breakfast food. In fact, when he tasted it, my husband thought it was a new pie recipe that I was developing. Let’s just say he was ALL over it! I wanted a crust with texture, so rather than using the food processor to make the crust (like you might with a graham cracker crust), I chopped the nuts with a knife and crumbled the Corn Flakes by squeezing them by the handful. I melted the butter in the oven as it was heating. No special technique with the filling, just mix yogurt, eggs and orange juice and zest. 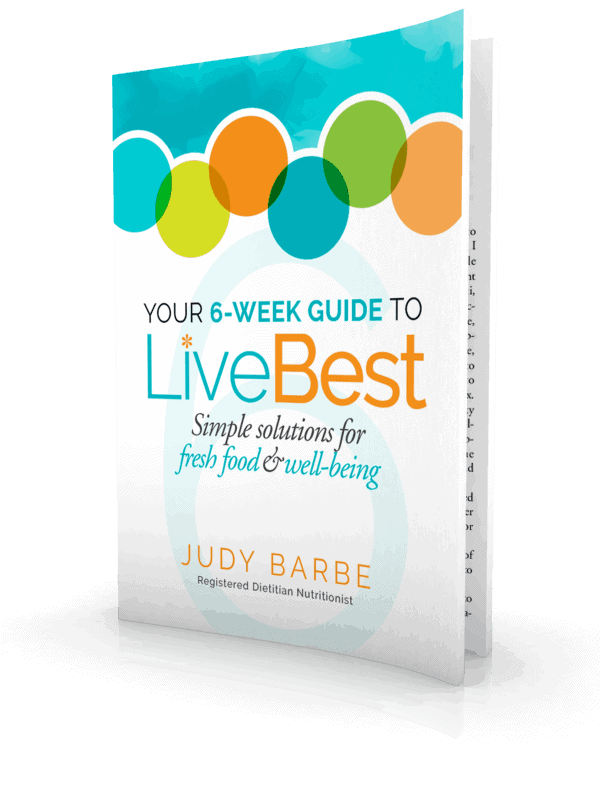 But if you want to mix up the flavors, you could substitute any flavor of yogurt or fresh juice. I followed the package instructions from a bag of fresh cranberries to make the cranberry sauce but spiced it up with whole spices I had on hand. I buy whole spices in ethnic stores because they’re less expensive. You may have a spice shop in your area or can order online at Penzeys. In this recipe, you could substitute 1/4 to 1/2 teaspoon ground spice, such as ginger, allspice or cardamom or 1 teaspoon five spice. These spiced cranberries can top other foods. Here’s how I repurposed them with yogurt and oatmeal. But wouldn’t they also be good on French toast? A cook’s tip: The good news is that fresh cranberries are available from September to November. Even better news is how well cranberries freeze. Just pop the bag in the freezer to use throughout the year. Maybe this should be called ANYTIME Tart because the flavor options are limitless. I can see this topped with a rhubarb in spring and blueberries in summer. Here’s a mango or berry topped Coconut Fruit Tart. A tart pan is useful because the sides can be removed for easier serving. Plus you can see the sides of the pie. I have several tart pans but I like the small scalloped edge of this one. A Microplane zester gets a lot of use in my kitchen. The sharp edges make zesting easy. And that means my food tastes even better because I easily boost flavors. Easy cleanup too because it goes in the dishwasher. 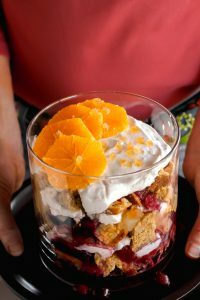 Another recipe you might like: Cranberry Orange Cornbread Trifle. This post contains affiliate links which means if you click through and make a purchase, the seller may pay me a commission. It does not increase the price you pay. Pie for breakfast? Yes, please! 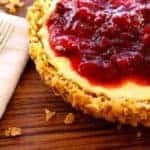 A crunchy Corn Flake crust with a creamy yogurt filling, this protein-packed Orange Cranberry Tart is so good you’ll also want it for dessert too! In a medium mixing bowl, combine melted butter, brown sugar, walnuts and Corn Flakes. Press into the bottom and sides of a 9-inch fluted tart pan with a removable bottom. Bake 10 minutes, until golden brown. Cool on wire rack. Meanwhile, in a separate bowl, stir eggs with a fork or whisk until they are thoroughly mixed. Add yogurt, orange zest and juice, stir to combine. Pour into cooled crust. Bake 25-30 minutes. Allow to cool. Refrigerate at least one hour. Can be refrigerated overnight. In a medium sauce pan, add cranberries, sugar, water and optional spices. Cook over medium heat, until mixture comes to boil, stirring occasionally, Reduce heat to low and cook 10 minutes, stirring occasionally. Remove from heat. Allow to cool. Remove whole spices. Refrigerate until ready to assemble pie. Just before serving, top pie with cranberries. 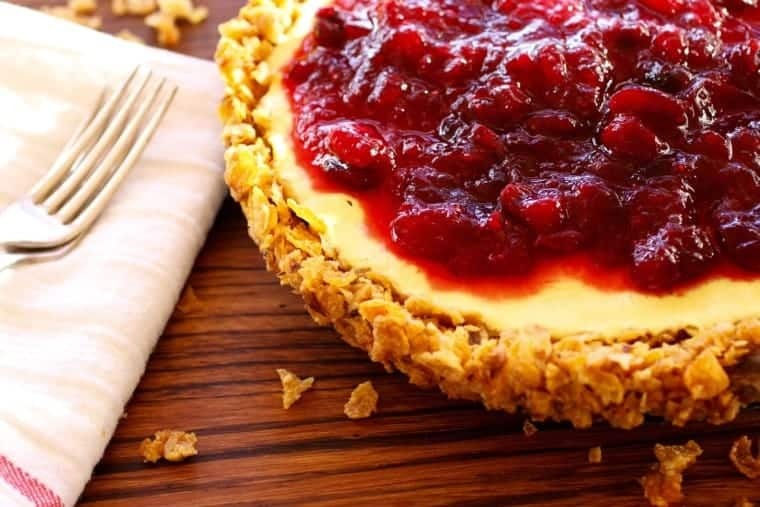 You may have leftover cranberries. This pie needs to refrigerate at least an hour before serving. 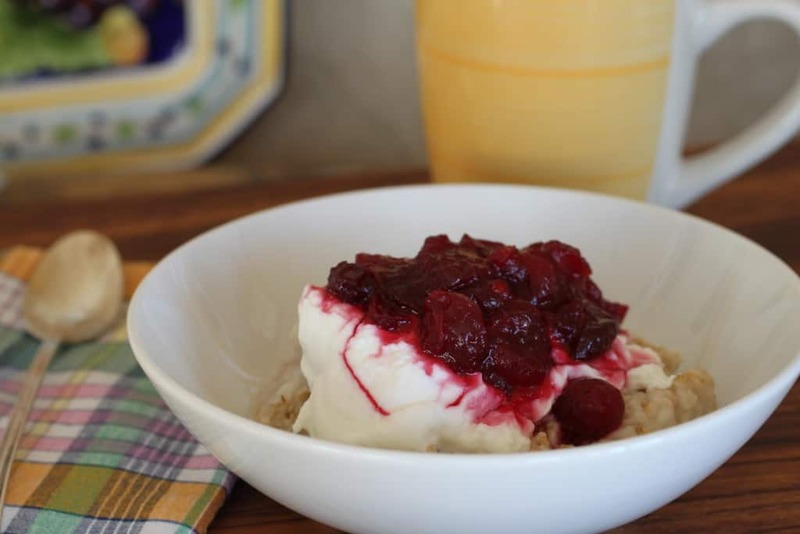 Use the leftover cranberries sauce on pancakes, oatmeal, yogurt or biscuits. Thanks, Deanna. Don’t you love having food ready to go for guests? This simplifies the dilemma of what shall I fix! I love everything about this! So perfect for the holidays! 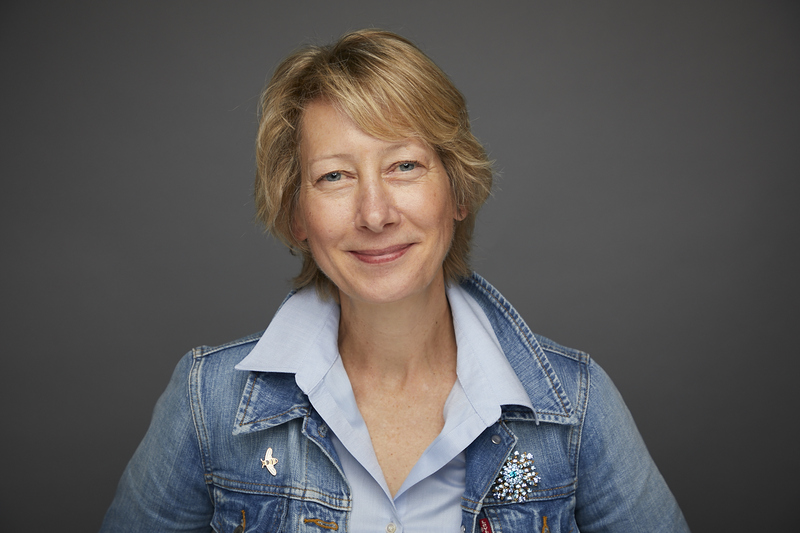 Thanks, Karman! Let me know if you make it. Thanks, Erin. We share the same crust interest! This tart looks amazing Judy! I think I would eat it for breakfast and dessert!! Hi Heather, That’s exactly what we did 😉 Enjoy! and Happy Thanksgiving.